In Oman, leading drives and controls manufacturer Bosch Rexroth has reaffirmed its commitment to the filter technology through providing Rexroth filter components to Fluid Power Technology (FPT), which serves as its distributor in Oman. Rexroth filter technology is able to aid the FPT service team with components that successfully built the filtration trolley. “Our product range includes measuring devices for oil cleanliness, water concentration and specific condition monitoring systems for hydraulic fluids. Covering each application Rexroth has the right solution for the filtration of hydraulic fluids, lubricants, industrial liquids and gases,” said Cornelius Boecher, global head of filtration sales, Bosch Rexroth. During the repair process, the FPT service team was able to monitor the reduction of 70-75 per cent of cylinders and pumps break down which occur due to contaminated oil. “We repair nearly 300-400 cylinders and 25-30 pumps per month. It was noticed that almost all the breakdowns for both cylinders and pumps were due to contaminated oil,” said Anil Kumar, workshop service manager at FPT Oman. Rexroth filters and Rexroth oil certification components are already being used in FTP’s oil purification services. 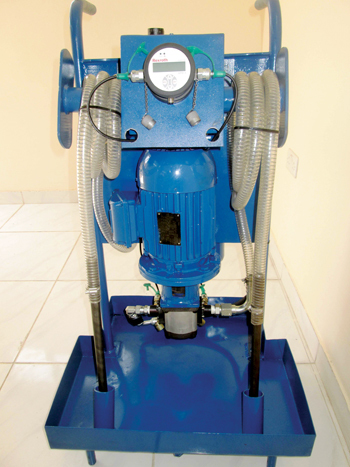 In order to reduce contaminated oil breakdowns, FPT manufactured the filtration trolley using the Rexroth gear pump, Rexroth filter and Rexroth oil cleanliness monitoring equipment (OPM). The product improves the components and system filter lifetime and provides greater machine availability by having longer oil change intervals. Due to its compact design, minimum space is required. “Maintenance is an easy process for elements that have a high contamination retention capacity in addition to the continuous monitoring of solid particle contamination class during oil cleaning.” said Kumar. “Focused monitoring of oil cleanliness and conducting oil analysis provides information on the condition of the operating medium at an early stage and thus contributes to preventing expensive repairs, downtimes and unnecessary oil changes.” said Chris Gray, an expert in oil contamination at Bosch Rexroth. Rexroth components which are used in the filtration trolley are the inline filters and the online particle monitor OPM II. The inline filters are used in hydraulic systems for separating solid materials from the hydraulic fluids and lubricating oils. The OPM II is a visual online particle monitor that operates on the light-extinction principle in which the degree of contamination and the purity trend of fluids can be accurately monitored and documented. An alarm has been added which is triggered when limit values are exceeded and this allows for a fast reaction. Bosch Rexroth advised it would be better to clean up oil and keep it clean than wait for contaminants to destroy machines.